In the AOTA’s Advisory Opinion on Cultural Competency and Ethical Practice, they state that “cultural competence is key to effective therapeutic interactions and outcomes,” and I vehemently agree. However, as of 2006, over 72% of students in OT and OTA programs and nearly 90% of students in OTD programs in the United States were Caucasian. These disappointing data (although they are outdated) indicate that students and professionals in our field may not represent a sufficiently broad range of experiences, perspectives and backgrounds that are vital for successful therapist-client relationships and meaningful professional development. Increased diversity within the profession means that occupational therapy will be improved for both clients and practitioners, and the addition of more socioculturally diverse professionals to the workforce will result in more effective and culturally appropriate client care as well as enriched professional exchanges. So why does diversity matter? Socioculturally diverse therapists are better equipped to approach clients and treatment sessions with a global perspective, incorporating a client’s unique background and life experiences into culturally appropriate treatments that will be better-received and more effective. Increased diversity in the profession will also benefit the professional community, as a wider variety of perspectives, experiences and areas of interest will likely generate a wider range of research topics, educational experiences and professional resources. 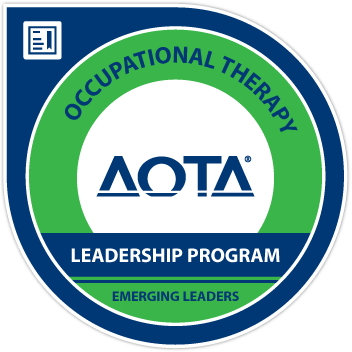 Ultimately, greater diversity within the field of occupational therapy will lead to improved treatment for clients and a professional body that is well-prepared to work with the increasingly diverse consumers of occupational therapy in the United States and around the world. In order to achieve AOTA’s Centennial Vision goals of greater diversity within the profession and greater awareness of the profession, educating and recruiting diverse populations about OT is vital, especially minority youth and young adults who are beginning to consider their career options. 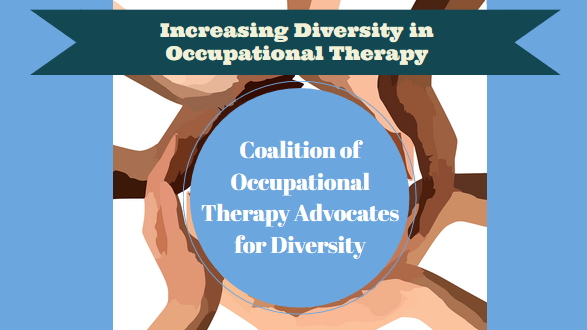 Fortunately, there is an organization of occupational therapy professionals who share my beliefs and passion for promoting diversity, and it’s called the Coalition of Occupational Therapy Advocates for Diversity (COTAD)! COTAD is made up of current OT professors and practitioners from all over the country. And although they have diverse backgrounds and experiences in OT, they all share at least one professional interest – increasing diversity in the occupational therapy profession. According to Jordan Skowronski, a COTAD member who I spoke to about the organization, COTAD was formed by a group of practitioners who are seeking to bring the conversation about professional diversity to the forefront, promote occupational therapy to diverse groups of people, and change the current statistics about sociocultural diversity in the profession. There are many resources available on the COTAD website, including links to informative Powerpoints from their previous AOTA Annual Conference presentations, an in-depth page with links to OT assessments and documents available in Spanish, and handouts about recruiting diverse students and clinicians. Each member has also posted a video describing how they are taking steps to encourage and support professional diversity, which you can view HERE (scroll down to “COTAD Media”). The members of the organization are also developing an article for publication in OT Practice magazine, so stay tuned! I was able to attend COTAD’s presentation at the 2015 AOTA Conference, and I had a great time! The members of this team are all very sharp, and they have a lot to offer the profession and the greater world. I hope you’ll consider becoming a member of COTAD, and please share the information about this fantastic organization with other students or professionals who may be interested! If you are interested in learning more about the issue of increasing diversity in occupational therapy, check out the following links to learn more. Read the previous blog post I wrote about my experience with diversity (or the lack thereof) in multiple arenas in OT. AOTA Multicultural Networking Groups: Investigate the activity of culturally diverse groups working with AOTA. AOTA Volunteer Leadership: Join the Coordinated Online Opportunities for Leadership (COOL) database to find opportunities related to diversity initiatives. Many committees are actively recruiting diverse professionals to help complete projects to support and benefit the profession. Sign up and get involved! World Federation of Occupational Therapists (WFOT): The WFOT site has links to multiple resources about practicing with people of multiple cultures and backgrounds. It’s also just cool to peruse the website and learn about different perspectives on OT from around the world! Note: I did not receive any kind of compensation for this post. I just like to support OT professionals who have the same kind of goals, interests, and ideas as I do! Next Article Apply for Editor Position with SPin OT!